Dry times in southeastern England are seasoned with the favorite flavors of leaders in the arid American West: drought declarations, water restrictions, a desalination plant, and talk of piping “surplus” water to the south. 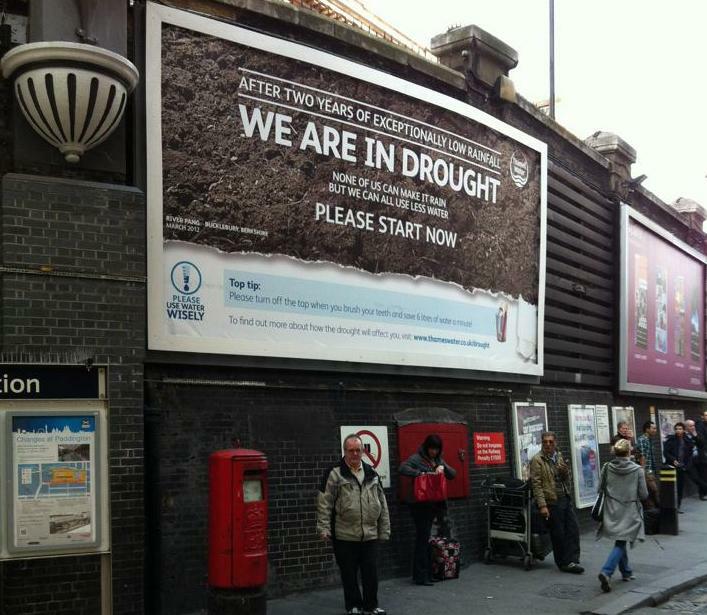 An advertisement at Paddington Station encourages London residents to start using less water immediately. Because of two consecutive dry winters, the driest six months on record in the eastern region, and the arrival of warmer weather, much of England should remain mired in a severe drought for the spring and summer, according to a forecast released on March 13 by the United Kingdom’s Environment Agency. The cumulative effect of nearly 18 months of low precipitation in the south and east of England has prompted water utilities to restrict outdoor water use and has already caused a few streams to dry up this winter, when flows are usually highest. If the spring is drier than normal, as the agency predicts, water restrictions for agriculture will affect food production, and fodder for livestock will become scarce and expensive. Taken together, these circumstances are a harbinger. In February, Caroline Spelman, the environment minister, told the National Union of Farmers that a drier climate for England “may be the new norm,” according to the Guardian. Earlier that month, Spelman had convened a drought “summit,” where policymakers, environmental groups, water utilities, and farmers discussed what actions to take during England’s worst drought in more than 30 years. The minister’s assertions about new climate norms are backed up by government climate models. For the east and south of England, the Department of Environment, Food, and Rural Affairs predicts an increase in winter precipitation, but a corresponding decrease in summer rainfall, when water demand is greatest. Domestic water users — who average 139 liters (36 gallons) per person per day, according to analysis from Global Water Intelligence — are being asked to tighten their belts. Domestic water use in the U.K. averages 139 liters (36 gallons) per person per day, according to analysis from Global Water Intelligence.A day before the government released the official drought report, a group of seven UK water utilities announced a temporary hosepipe ban for residential water use. Starting on April 5, essentially all large-volume outdoor water use will be cut off for more than 18 million customers, including those of two of England’s biggest water providers, Thames Water and Anglian Water. Residents can still water lawns, wash cars, or fill pools, but only if they use a bucket or can. A spokesman from Anglian Water told Circle of Blue that in 1990 the utility last banned hosepipes, a restriction that was kept in place for 15 months. Thames Water, by contrast, last banned hosepipes in 2006. Two years ago, the chief water supplier for the London area opened the U.K.’s first mainland desalination plant, a facility designed to be a support system during times of drought and capable of pumping out 150 million liters (39.6 million gallons) per day, or enough to supply 1 million people. A spokeswoman for Thames Water told Circle of Blue that the company plans to begin using the plant soon, but does not know when it will start running. These findings were used recently in a study released earlier this year from ratings agency Standard & Poor’s. The study — done in collaboration with TruCost, a group that analyzes environmental risk, and the Global Sustainability Institute at Anglia Ruskin University — found that, because of climate change and population growth, water shortages are likely in eastern England in the next two decades. The heart of the S&P report looked at how these changes will affect water and power companies. Electric utilities, most notably, will see costs rise because of scarcer processing water, higher maintenance costs, and operations curtailed by low water levels in rivers. Companies could also face political risks from changes to water withdrawal permits. The extent of these cost increases depends on future water availability and on the water-intensity of power generation. Neither EDF Energy nor RWE npower — two electric utilities in the east — have had operations affected by the drought, according to their media relations staff. Yet skimpy river flows, and myriad other environmental changes, are already apparent. Most of the rivers in drought-affected areas are “notably or exceptionally low” for this time of year, the Environment Agency noted in its report. The agency used the same language to classify groundwater levels for most of England. Soils are extremely dry as well, and many wetlands are at risk of desiccation, putting wildlife that depends on the boggy areas at risk. With the rainy season ending, there is little chance for these systems to be recharged in the coming months. Besides the April 5 restrictions on domestic water users, there are supply-side solutions being offered, though they seem less likely to be enacted. London’s mayor, championing an engineered solution, wrote in a Daily Telegraph column that the south of England should import water from Scotland and Wales through a series of canals. The surplus water could “refresh the breadbasket of the country,” he argued, and the canals would be “a beautiful thing,” to boot. Alex Neil, Scotland’s infrastructure minister, echoed the idea, but linked any water transfer to the construction of a desired high-speed rail line to London. “With Scotland’s plentiful supply of water and superb industry expertise, it is only right we offer our assistance in the long term,” said Neil, according to the BBC. By day, local farmers and their livestock roam the Peak District’s rolling country hills and the river that runs thru the middle. 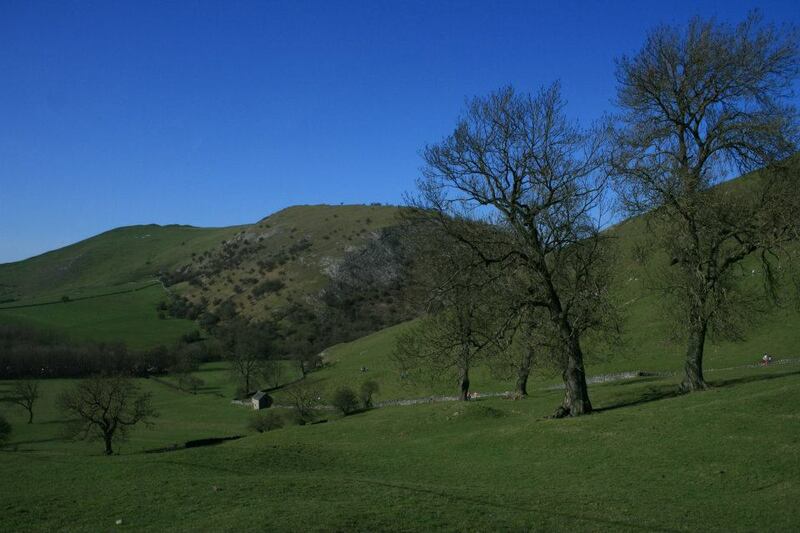 The Peak District is at “moderate risk” of drought, according to the latest UK Environment Agency map from March 12. If the spring is drier than normal, as the agency predicts, water restrictions for agriculture will affect food production and fodder for livestock. That idea of tapping into a distant “surplus” in the wettest parts of Great Britain has been kicked around the island since at least 1942, when engineer J.F. Pownall proposed a national water grid and a Grand Contour Canal winding south from Scotland. Sarah Hendry, a lecturer at the Center for Water Law, Policy, and Science at the University of Dundee, told Circle of Blue that, though Scotland’s water agenda contains a line about bulk water sales, the talk of long-distance transfers is a “bit of a distraction” from the discussion about workable solutions. Read more of Circle of Blue’s coverage on water issues in the United Kingdom. Hi Brett, thanks for sharing this valuable info in here. Political issues have something to do with this also, and it’s much more difficult to handle than that, having an ecological problem around the issue. Thanks for the article, Brett. Pownall’s Grand Contour Canal was intended to transport water from the Lake District in north-east England to drier parts of the country. A map by Mike Stevens shows the intended route: http://j.mp/HNtYy6 . The Wikipedia article on the Grand Contour Canal seems to be based more on comments by Boris, than on any research into Pownall’s proposals or for that matter any grasp of the technical issues. Pownall’s proposals did not involve water from Scotland. Pownall had grasped that a peculiarity of English geography was that much of the country was linked by the 300 foot contour line. The problem with most English canals is changing levels means lots of locks, which are expensive to maintain, and cause delays. In many parts of the canal network water needs to be pumped up to summits. By building a very gentley sloping canal (1:20,000 if I recall correctly) water could flow from the wet Lake District to the drier parts of England, but the flow would not be so strong as to inhibit safe navigation. Water from Wales has supplied Birmingham in England’s West Midlands for decades; it is not pumped but is transported by gravity. Despite this, every time the subject of moving water across the country is raised it can be guaranteed that some so-called academic will start waffling about ‘energy issues’ .